Very excited to announce the release of our 12th cassette, KI from Brooklyn's CHONUS (aka Tony Gedrich) in his first solo electronic outing. KI will be available in a limited edition of 100 emerald green C44s loaded with cobalt tape (known for its low noise floor, silky highs, and exceptionally warm and punchy bass), and in a first for W+D, digitally via Bandcamp on the same day as the physical release — Saturday, August 10. Then mark off the afternoon of Sat. 8/10 for the release show and listening party, to be hosted at the charming neighborhood bar Capri Social Club in N. Greenpoint. 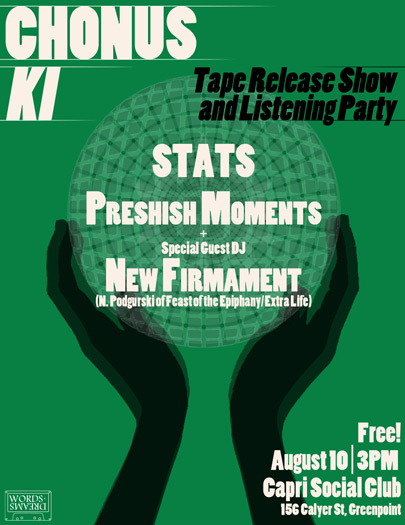 Free show, cheap beer, a couple of great live acts, and a culmination in a full listen-though of KI - RSVP here!